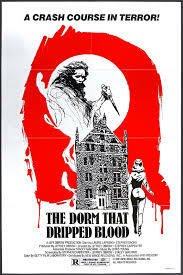 During the Christmas holidays, five students have volunteered to help shut down a condemned dorm, just as a mystery murderer knocks out the power, cuts the phone lines and kills their friends with power drills and industrial steam cookers. Chief red herring is a 6-foot-plus frizzy haired weirdo (Woody Roll) who hangs around skips in the dead of night and even holds a bloodied machete in a sinister fashion at one crucial point. Aided by an effectively tense, eerie score by a pre-HELLRAISER Christopher Young, this micro-budget slasher movie offers no one to sympathise with, but it does have some nasty kills (watch out for the spiked baseball bat!) and a mean-spirited ending in which the giggling killer cleverly frames an innocent man for the murders before shoving the unconscious final girl into an incinerator. God bless us, everyone!